If you have been following along on my Instagram stories, you'll see that we've been hit with a rush of springlike weather. As much as I'd like to cheer about that, a few weeks ago we were hit with a massive snowstorm, so those spring temperatures and rain caused the snow to rapidly melt, which resulted in a lot of flooding to our town. Water is floating to the tops of the bridges, roads and schools have been closed, and playgrounds now look like water parks. It's a hot mess. Thankfully, we live far enough away from the rivers that it didn't affect our neighborhood, but it's a sad sight to see some of our favorite local spots buried under water. On the bright side, we've had a lot of sunshine and warm temps, which lead me to believe that winter is about to take its last breath. I've been gazing out over my garden plotting what's getting planted this year and am itching to get started. I've had a hell of a time getting zucchini to grow, so that's not going in this year, but I have an assortment of colorful fruits and veggies going in instead. 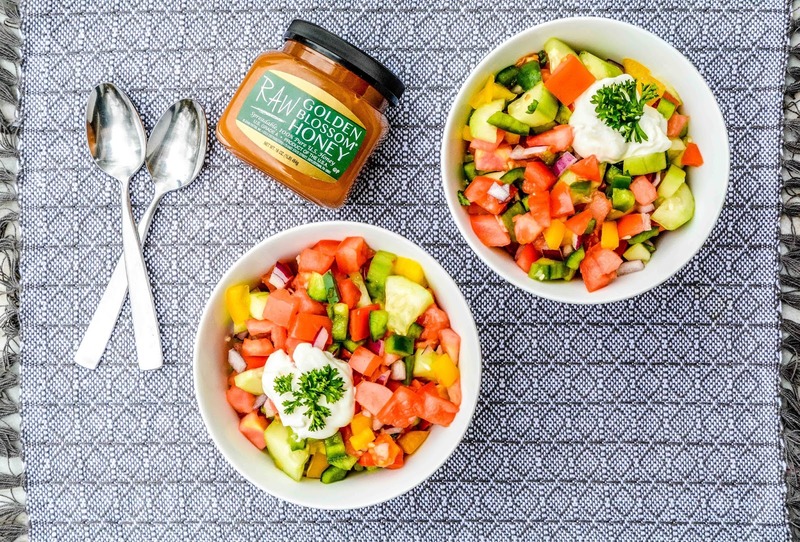 Red and green peppers, tomatoes, cucumbers are all on the list, so when I saw this Gazpacho recipe on Golden Blossom Honey, I knew I better save it for some of my home grown goodie this year. I'm a sucker for bowls packed with colorful goodness so this recipe is right up my alley. My 14 year old is super picky when it comes to food, but asked if she could have a bowl for herself. Then, she snubbed her nose up to it when I told her it had onions in it. But, when I broke out the sour cream, her tune changed and she reclaimed a bowl for herself claiming that it was, in fact, delicious and that she couldn't even taste the onions. Now, she did put in a few tablespoons of fat free sour cream which toned it down, but hey, if it gets her eating her veggies, I'm all for letting her indulge in a few extra scoops of sour cream. This gazpacho would be a perfect addition to your springtime gatherings. Maybe toss together a batch for Easter this year? Are you getting spring temperatures in your area now, or does it still look like winter? I'd save gazpacho for summer tomatoes, these winter ones taste like plastic :( Lovely photos as usual, dear! We've been hit by Beast from the East storm and it has been snowing all week long with as low as -18*C temps. Snow in my yard is now well over knees. They say we will have ice rain on top of it tomorrow and I cannot handle the thought of it... nothing scares me more than ice rain, nothing. It is so cold that I haven't even opened my drapes for two days on my balcony doors, the glass is just pure ice. Oooh, I don't want to be anywhere near your area right now. I have my fingers crossed that stupid snow is long gone for us. We had a horrible ice storm here about 10 years ago. We would be driving down the road watching power lines pop and spark, causing a huge outage. I think we were without power for 7 days and that was the most miserable I have ever been. So cold, no power, lost half of our food. Dahlink, I pray you get nothing like that with your ice rains! Sure the perfect healthy meal there. Blah to all the flooding. Our weather is still meh here, but no flooding at least...yet. And hopefully you don't get any flooding! It's a mess here! Yep, I'd allow the sour cream too. Definitely if it's getting the kiddos to eat their veggies. Sorry to hear about the flooding!! Hurrah to winter's last breath. Whatever gets them eating those veggies is a okay in my book! I know healthy eating is best, but in this case, I'm all about the sour cream. It just goes perfectly with dishes like this. I love how light and fresh that looks. You and me both. But hey, as long as it's fat free, I say it's alright to indulge in a few extra scoops, right? This recipe really does make me think of spring with all that tomato goodness. I have never made gazpacho but I will keep this recipe handy for when I get some tomatoes and honey. I love gazpacho. I think adding sour cream and honey to it is perfection, no matter what the season. Stay safe in the storm. It's coming down strong here. Talk about enjoying all the fresh produce that comes with Spring! I think this is perfect! It's something that I would make for lunch and I'm sure I can talk the kids into trying it as well. 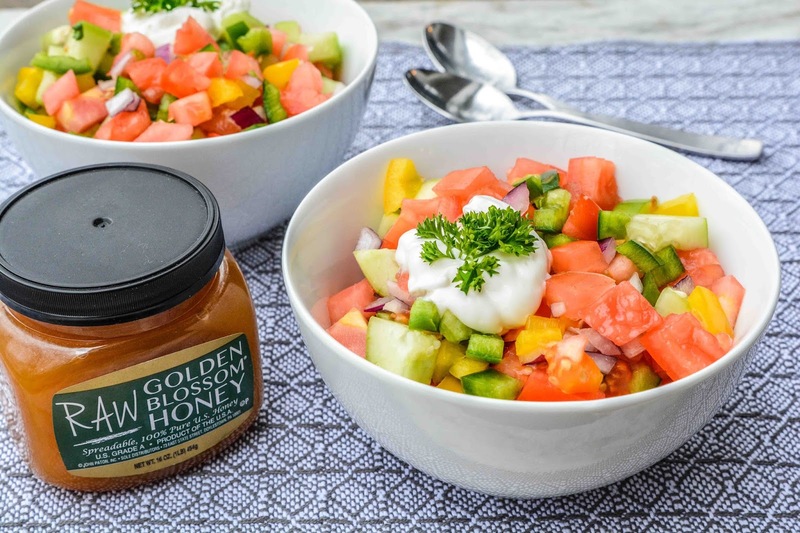 I always love coming to your blog and learning all of the cool ways you eat honey! I would love to try this gazpacho recipe! This looks absolutely delicious. I would eat this everyday! It does look good. I like stuff like this, but instead of sour cream I use plain Greek yogurt with a splash of lemon or lime juice in it. Looks like a really yummy salad. I keep coming back to your blog for recipes using honey. I am doing my best to choose healthier meals as this year did not start right for my family. It seems we have been taking turns getting sick. Hopefully our health will improve soon. LOve this gazpacho, looks absolutely stunning Theresa like all yours recipes!! Oh this looks soooooo yummy. I am curious now how it taste. Hope can try it soon. ~~ thanks. We had some temps hit close to 80 over the past few weeks, but late last week and all of this week it's been in the 60's. I'm enjoying it, though, because the heat here comes so fast and stays so long, I'm enjoying the cooler weather while it lasts! I would be in heaven in the 60's this time of year! We're having record snowfalls. I am soooo over winter already!